Cooking prime rib perfectly every time is easy with this prime rib recipe. Traditional prime rib roast with all the trimmings is a perfect family comfort food meal, but also makes a grand centerpiece for any dinner party or holiday meal. 1. Place the roast on a rack in a roasting pan, bone side down. 2. Season the roast with salt and pepper, or try something different by using one of the rubs below in our More Prime Rib Recipes section. Insert the meat thermometer into the center of the roast, making sure you avoid the bone or fat. 3. Roast the meat, uncovered, in a 325ºF (160ºC) oven until it reaches the desired doneness. Then remove the roast from the oven and tent it with foil for a minimum of 10 minutes, up to 30 minutes. This allows the juices to flow back into the meat (they will run out if you cut right away and the meat will be less tender) and the temperature rises another 5ºF. Click here for exact prime rib cooking times and instructions. Make it perfect every time, whether you like it rare, medium or well done. 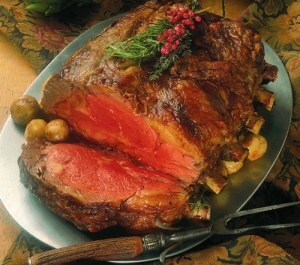 Remove the twine if there is any and carve the prime rib across the grain in 1/4" to 1/2" thick slices. Allow at least 4 ounces of cooked prime rib per person. The secret to a perfect prime rib recipe is a meat thermometer. If you don’t have one and can buy one before you cook the roast, do. It really makes a difference. If you can’t get your hands on a meat thermometer, just go by the Prime Rib Cooking Times information you will find here and your results should still be good. When you are ready to carve the roast, stab the meat with a long fork and tilt the roast so the rib bones are straight up. With a carving knife, cut parallel to the ribs, separating the ribs from the meat. Then, with the bones removed, set the roast rib side down and carve into slices 1/4″ to 1/2″ thick. Prime rib is a premium beef roast. To keep the meat at the optimum temperature when it is served, make sure the plates are warm. Rinse in hot water before serving, put them in the dishwasher on the heat cycle or warm them on top of the stove, alternating the bottom dish so they all warm. When you order your roast ask the butcher for the small end of the prime. The smaller end is more tender. The bones are also smaller. You can also ask the butcher to trim the backbone off the roast, but ask that they leave the rib bones connected. Keep in mind that outside of the roast is more done than the inside portions. If you have a portion that is rarer than someone wants, place it in the pan with drippings. Cook it on top of the stove for 30 seconds on each side. Look here for tasty rubs for your prime rib recipe and kick it up with new taste twists. Don’t forget our delicious easy yorkshire pudding recipe! Originally submitted by marja buzzell of Dixville Quebec Canada. This recipe works well with leftover roast beef,and gravy. Peel a pot of potatoes and carrots. Bring this together to a boil. When they are cooked, mash the mixture well and add salt and pepper to taste, plus some milk, butter or margarine. Set aside. Slice your leftover roast beef thinly, add this to your gravy and heat this. In the meantime put the mashed potato and carrot mixture in a casserole dish and heat this in the oven. When served, put the potato and carrot mash on the plate and add a ladle of gravy mixture over each individual plate. It is scrumptious,especially on cold winter days.